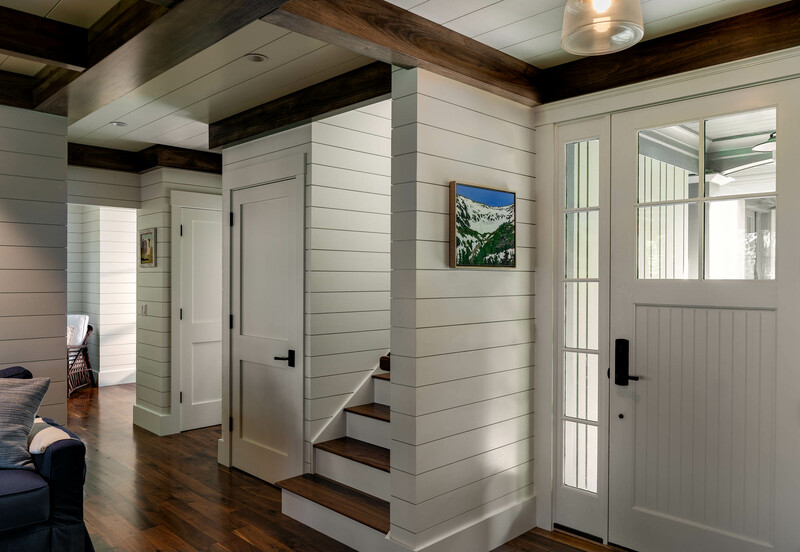 This New England cabin was designed with the intent of enjoying the best of summer vacations and ski trips. 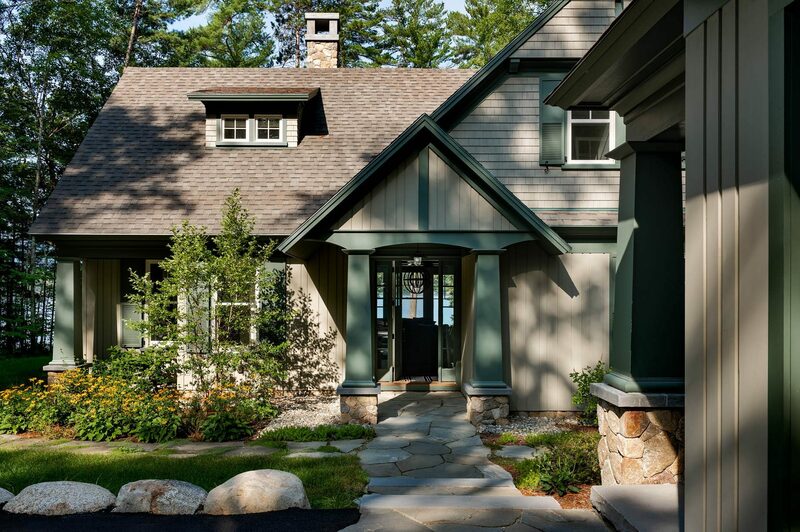 The home is complete with all the features one would want in a vacation home and was designed to maximize the magnificent views of Silver Lake. The main house can comfortably accommodate up to 12 guests with an additional guest suite above the garage. 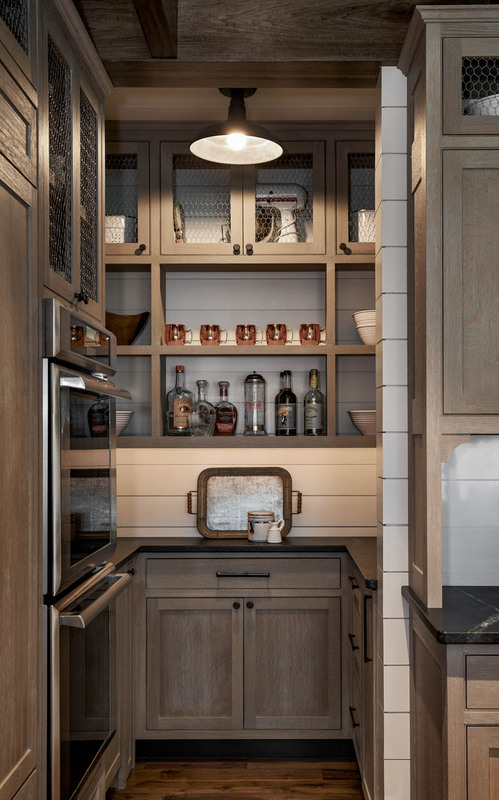 The first floor of the home has an open concept design that includes an eat-in kitchen, large dining area and living room with a stone fireplace. 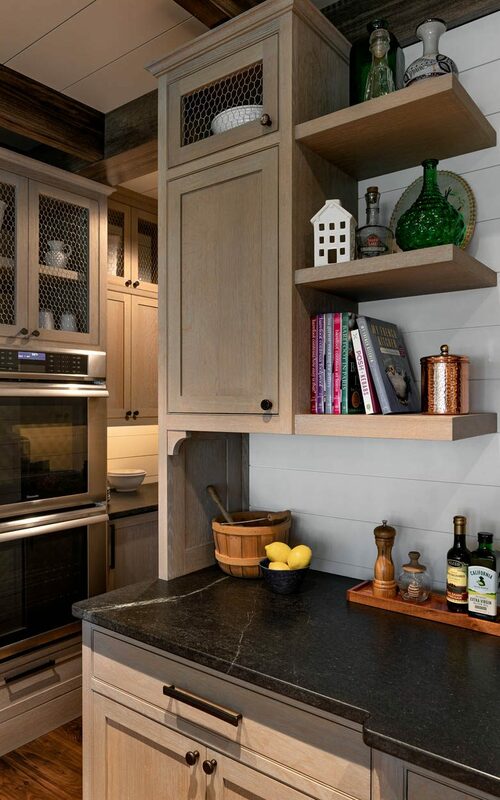 The kitchen is complete with a large island, ample cabinet space and a pantry area. 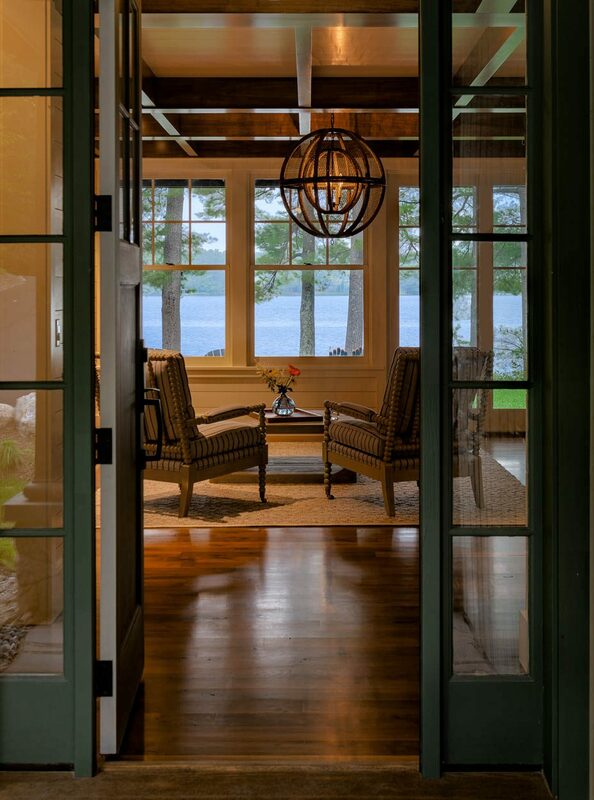 A large patio facing the lake can be easily accessed from the main living area or the master suite. Adjacent to the living room is a den that includes a TV/reading nook with a built-in entertainment stand. The second floor has three bedrooms, one a bunk room and a large bathroom. 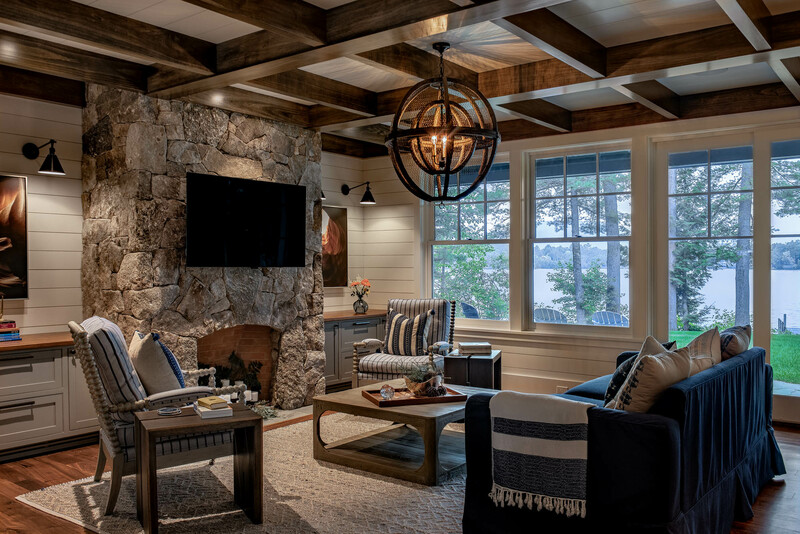 The primary composition of the home is built around a neutral color palette and rustic fixtures and features. Our client chose a chicken wire orb light for the living room and a translucent Capiz shell light for the dining area. Globe lights can be found throughout the stair and TV/reading nook areas. 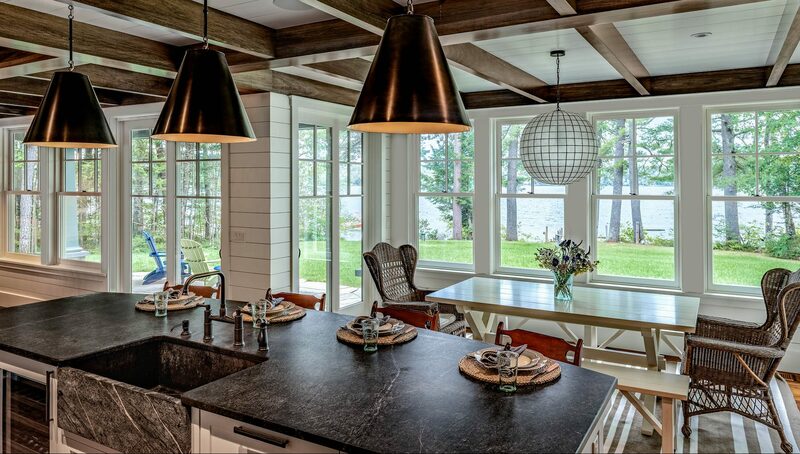 Above the kitchen island is a pendant trio with antique nickel shades. 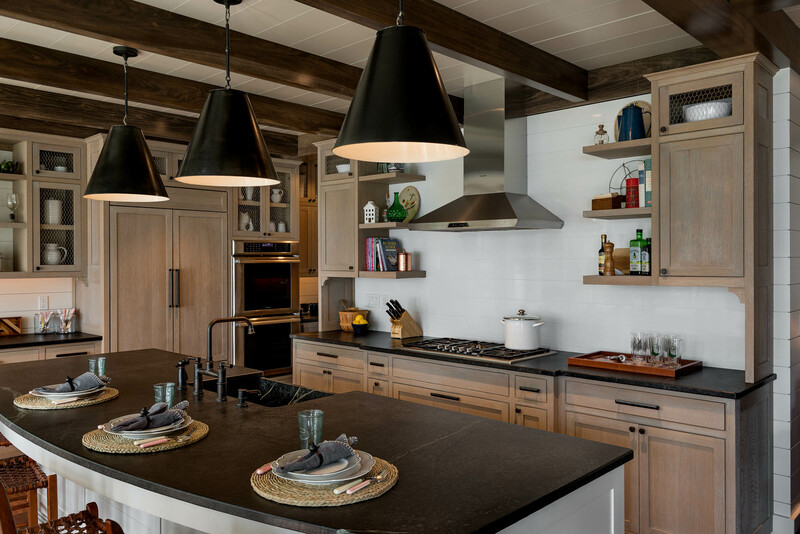 The kitchen cabinetry is comprised of a rustic French country matte finish with chicken wire panel doors and dark bronze hardware. 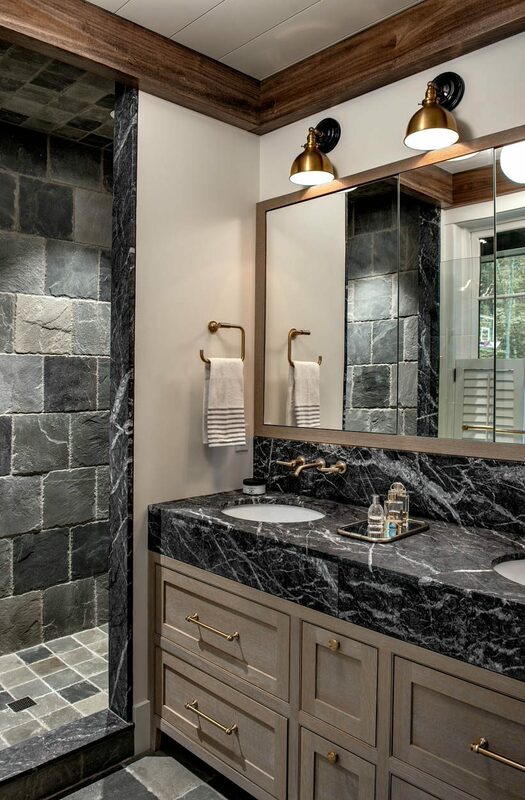 The master bathroom and half bath both contain natural slate tiles with a tumbled edge finish and brushed brass fixtures. The second-floor bedrooms are simplistic with natural fiber wool/sisal rugs and natural fiber roman shades. 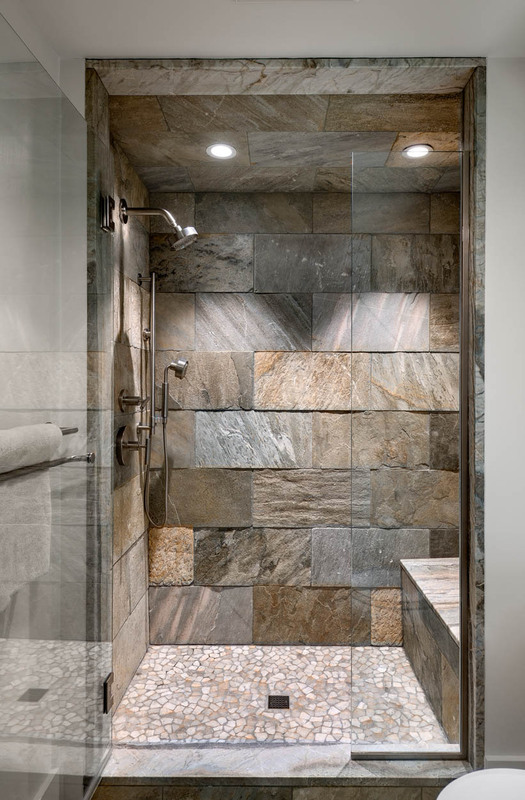 The second-floor bathroom features larger, white subway tiles with a large format gray porcelain tile and a navy blue double sink cabinet. The bunk room has six built-in beds, each with a reading light. 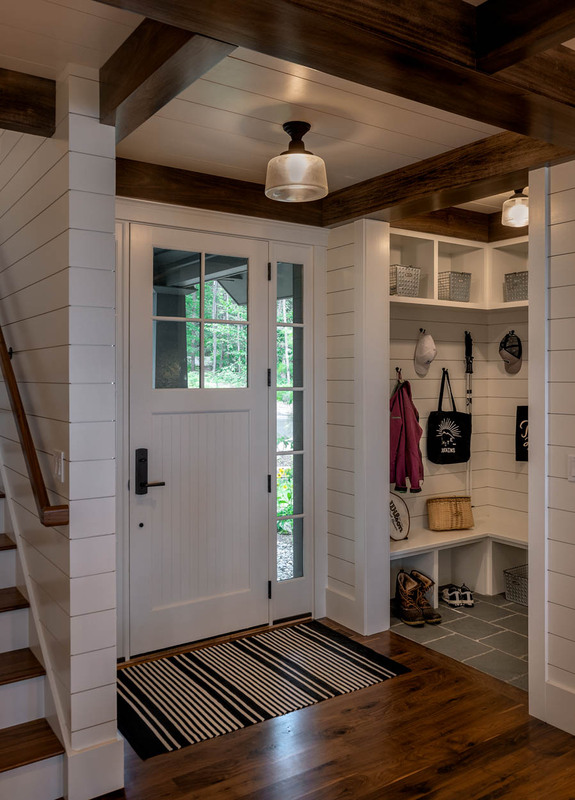 The garage contains a one-bedroom guest suite with a private bathroom and storage space for canoes and skis. TMS Architects assisted in selecting and sourcing furniture for the living room and master bedroom. We chose to do two facing slipcovered sofas in an indigo blue outdoor fabric, along with two spindle chairs in a soft blue stripe. We were able to incorporate some of the client’s personal photos in the living room from a family trip they had previously taken to Antelope Canyon. The photos were printed on canvas and stretched to a custom size. In the master bedroom, we carried through the black and white natural feel into the rug. 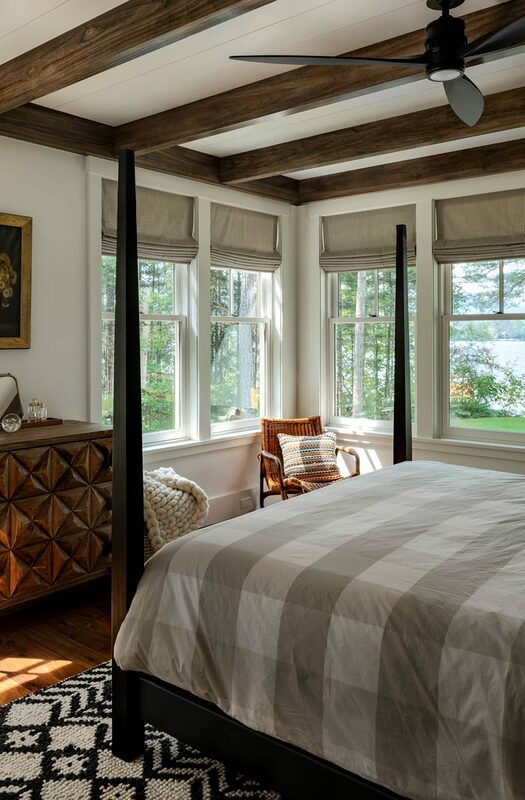 The black four-poster bed was custom made in Maine. 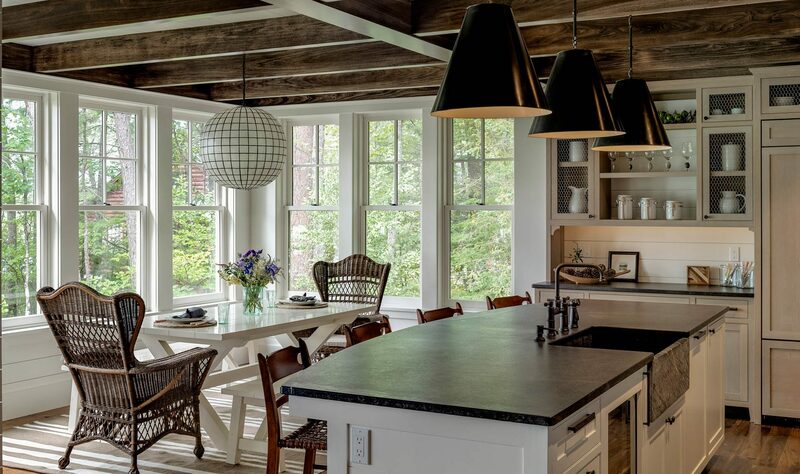 The roman shade fabric with a black and white ticking stripe embodies a quintessential New England feel with a modern twist. 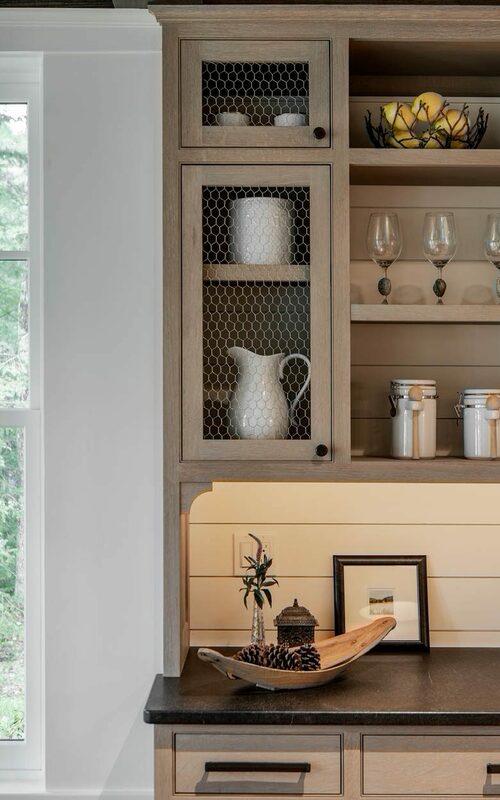 A playful carved wood dresser, along with a rattan side chair and ottoman were added to complete the room.